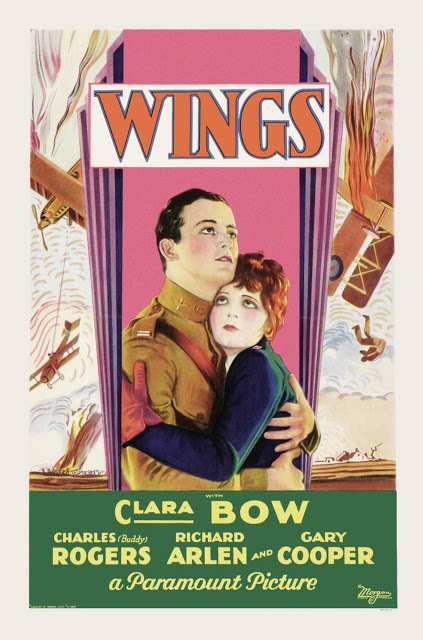 As a postscript to my last entry here at Cinedrome, I’ve just learned that Cinemark Holdings, Inc. is presenting one-night- only screenings of Wings this month as part of their Reel Classics series. There were two of them scheduled, but the first one (on May 2) was over before I knew about it. That leaves one more, on Wednesday, May 16. Go here on the Cinemark Web site and click on the Wings/Reel Classics box at the bottom of the page to see if there’s a participating Cinemark theater near you. If there is, you’ll find it well worth your while. Based in Plano, TX, Cinemark has theaters all over the country, though not all of them are participating in this Reel Classics series (upcoming titles include Citizen Kane, The Searchers, North by Northwest and Cabaret); other chains under the Cinemark umbrella include Century, CineArts and Tinseltown theaters. The screenings, of course, will be the brilliant Paramount restoration I wrote about last time; kudos to Paramount for doing it right and standing behind their product to the extent of furnishing these big-screen showings. If all extant silent pictures got the same loving care, we’d have an embarrassment of riches on our hands. I plan to catch the screening here — if only to see how many people show up (the attendance at Casablanca in March was quite impressive — but of course, that was Casablanca). I may be there all by myself, for all I know — but if I’m not, those other folks can hardly imagine the treat they have in store. Thanks so much for providing that link and info on Wings. I had no idea that our favorite theater (Tinseltown) is a Cinemark theater!!! And I checked and Wings will be airing there twice on the 16th. Going to work on getting a few friends to go see it with me. So excited! Glad to hear it, Page, and happy I could help. I say again, you won't regret it, I'm sure. Be sure to drop back after you see it and leave a comment letting me know how it was. Jim, a million thanks for this. It's playing by me at the Seven Bridges in Woodridge. I'll be there for sure. Thanks so much for the heads up. Around Easter Cinemark showed "Ben-Hur" with hardly any advertising. I hadn't heard about "Wings" either until I read your post. I will also drop back and let you know how it went. Very excited about this. Simply put, one of the greatest moviegoing experiences of my life. Just stupendous on every level. I knew I was in for a treat when I started geeking out over all those Paramount logos over the last 100 years. It was all uphill from there. The 2.5-hour running time flies by. The air combat sequences (and there are a lot of them) are amazing. Less than 10 years after the war was over so all the equipment is contemporary. No miniatures of special effects, director William Wellman (who flew in WWI) and other former WWI pilots hoisted the cameras in the planes with them to capture all the dog fight sequences and the swooping, swirling, etc. On the big screen it was amazing. Just an incredibly awesome movie, and a high I am still on. There’s a reason why it won the first Oscar for Best Picture. Boy, Clara Bow was absolutely adorable. When I buy a Blu Ray player, "Wings" is the first Blu Ray I'm going to pick up. I wish Cinemark had done a better job of promoting the screening, but a million thanks Jim for alerting us to it. My pleasure, Kevin, and glad to hear your reaction. Ten people isn't really so bad, considering that the showings were practically a secret. At the 2:00 showing here, my friend Don and I comprised 25 percent of the audience. I wasn't able to catch the whole 7:00 showing, but I did drop by in time to catch the last half-hour or so (from the last scene between Buddy Rogers and Richard Arlen); there were a couple dozen in the house, about 50-50 male and female. I chatted with some of them in the lobby after, and all were appreciative (the picture got warm applause, even from that modest crowd). One couple had even made it down to Oakland for Napoleon (a week before I saw it). I had the same reaction to the parade of Paramount logos: At first I thought, how crude to tack the current logo on; then, when I realized they were, so to speak, taking us back in time to 1927, I realized how much real thought had gone into this video transfer. As for Clara, well, what more can I say? She was the It Girl, all right, and to see her in action is to understand at last what "It" really is.